The 2011 Burning Man festival starts in just a few short days, and with that we have an excellent mutant vehicle accessory that no insane desert dweller should be without. An Arduino powered fire cannon sequencer! [Paul] was asked by Lostmachine’s [Andy] to spice up the flame effects on their Priate Ship mutant vehicle and provide a cool looking fire show that represented the ship’s sails. [Paul] tossed together a hand full of arcade buttons, switches, and an LCD display to control eight 12V Solenoid valves tasked with switching on various regulated propane sources that throw some brutal looking flame effects. The controller combines a Teensy 2.0 with a custom board that contains eight P-channel MOSFET circuits. Flyback from the coils is handled through zener diodes, and the IRFR5305s are sized quite above and beyond what is needed for the 12v solenoids. With the heat, dust, and chaos of the desert one can’t be too careful. [Paul] even tosses in RC snubber circuits just to prevent things from getting too out of hand. Of the twelve arcade buttons eight are used for manual over rides, and the remaining four arcade buttons, knobs, switches, and the LCD display are all connected to the Teensy to handle the sequencing. [Paul], sadly, will not be able to make it out to Burning Man to troubleshoot the sequencer, which is a cause for some concern throughout the build. It just so happens that I leave for Burning Man this Friday, and have an 18″ by 18″ Hackaday QR Code that will mark my area, see if you can find me out there! Also check out a video of the sequencer controlling what is easily a 6 foot flame bar after the jump! It flys a pirate flag, and that’s the underlying theme. The visual design falls somewhere in the realm of Steampunk/Pirate. I was involved in this! Well, sort of. My sister helped construct the ship and we worked last week on rewiring the electronics that drive the lights. This really is a fantastic piece of mechanical engineering and art! 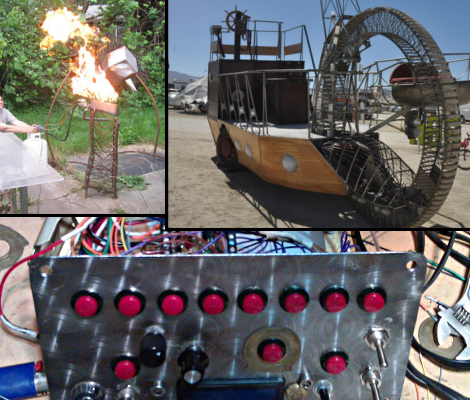 If you don’t see it at Burning Man, there are plans to take it to MakerFaire next year. OOOOOOOOOOOOOOOOO, brushed metal bezel. I have to get out to burning man some year and check out all the creations. I love this guys flame retardant wife beater he’s wearing :p fire is fun. The video here is just a test of the flame projector unit. The final mast has 8 of them that go off simultaneously making a massive “sail” of fire. You can see the masthead on the site now. Andy just uploaded a new video shot a few hours ago showing the mast assembly and all the plumbing that went into it. They -should- be loading everything onto the trailer right about now actually. Latest update from Andy on the ship.